US Road Trip – Interlude and Impasse | Where's my backpack? My flight from Boston to Seattle was on time, swift and entirely uneventful. I have tried to recall even a single moment of the flight and find I cannot, which speaks volumes about the experiential difference of slow versus fast travel. To be fair, the flight was also horrifically early, which might account for the huge gap in my memory. Chances are I was still, to all intents and purposes, asleep during the entirety of the journey. I remember saying goodbye to my friend on the sidewalk outside the terminal in Boston, and I remember being met by my brother in the Seatac terminal, but everything in between remains a mystery. In Seattle I hung out with my brother and my sister-in-law for a while, catching up on life and drinking copious quantities of tea. Then Jill (I have changed her name to protect the innocent! ), the girl I was going to share the next leg of my road trip with, arrived and we went back to her place to start making plans. We each had a couple of prerequisites. Jill wanted to hit Utah and California’s Lost Coast. I wanted to keep the trip to about ten days maximum, because I had the unenviable task of finding a job and an apartment upon my return, and couldn’t put it off too long. Jill and I are polar opposites in almost every way imaginable. She loves the details; I love the big picture. She plans extensively, sets goals and makes lists; I make outlines, embrace moving targets and scribble key words on tissue paper to be shoved in my pocket and re-discovered months later. When I get stressed, I do one of two things – grab my camera and go exploring, or immerse myself in a movie, preferably involving a hero named after the family dog and some ancient treasure in an exotic location. When Jill gets stressed, she does one of two things – immerses herself in a project that will require her to rework minutiae repeatedly, or cleans her house to within an inch of its existence. This last approach puzzles me the most – even thinking about house-cleaning stresses me out so much I instinctively reach for the latest Indiana Jones sequel. There truly is no justifiable reason why the two of us should even like each other, and yet we are the best of friends, a fact that shall remain one of life’s greatest mysteries. Our friendship has a long history and we have stood by each other through many difficult times. We have, however, never truly tested the boundaries of our friendship – and the most definitive way to do that is to travel together. This trip was going to be radically different to the one I’d just been on with Sprocket and my other friend, partly because my other friend and I share a very similar modus operandi, but mostly because we were going to be camping. Now I’ve camped before; I can remember exactly three times when I went camping; two of them with my family in Ireland. The first time we arrived so late there was only one tent site left, right next to the dumpster and a wasps’ nest. That didn’t work out so well. The second time we camped on a beach in north Dublin; the tide came in during the night and we had to scarper. Oh, and I went down with sunstroke. That didn’t work out so well either. The third time camping, I was with my brother in Greece, and we camped because we were broke. It was a big, open site with tents pitched inches from each other, hot showers and a cheery little restaurant that served great Greek food and showed reruns of old movies. We met loads of interesting people and got to vacation on the Greek Islands for next to no money. Result. My limited background in camping has very much informed my approach to it. As far as I am concerned, camping is for when you need to do things on the cheap. You sacrifice privacy and a little comfort, but in exchange, you get to see places you might not be able to afford to see otherwise. Jill, on the other hand, is a career camper. She camps for the sheer pleasure of camping. I just had to read that last sentence back to myself. Jill eschews the campsite that offers extravagant amenities like a restaurant, showers, a toilet. When she goes camping with her husband, they head to the back country and pitch a tent miles from anyone or anything. I did not know this, yet. One thing I did know, however, was that my friend was noticeably stressed – the kitchen gleamed spotlessly as I walked in the door. We chatted for hours; Jill talking about the things that were upsetting her; all of them were ultimately out of her control, but it didn’t make them any easier to deal with. I fumbled around for the right thing to say, but there was nothing I could say or do that seemed helpful. Almost everything I said actually had the opposite effect, causing my friend to bristle with anger. Over and over we mis-communicated, me saying one thing and Jill hearing something completely different. Eventually I gave up and grew quiet. When there was awkward silence, I resorted to humour, interjecting witticisms to lighten the mood. They didn’t. Sensing that we had reached an impasse, both of us visibly dismayed by the major communication breakdown between us, we instead turned our attention to the trip ahead. While I was on the road with Sprocket and my other friend, Jill had created a rough outline of where we were going to go, but had abandoned the project to work on a job application which necessitated the repeated tweaking of her curriculum vitae. While Jill worked feverishly on the umpteenth iteration of her resumé, I got settled in front of my laptop and started checking out routes and destinations. We were going to be travelling close to 4,000 miles in 10 days, so if we wanted to spend any amount of time at particular destinations, I figured we’d need to do at least a couple of long haul days. We could make it from Seattle WA to Moab UT in two days, then spend some time exploring Utah at leisure. From there, we could do another long drive back up to California where we could revel in the glory of the coast. I came up with suggested overnight stops, and went looking for campgrounds in the area. When I showed the results of my labour to Jill she looked at me as if I had gone mad. My first suggested stop was Twin Falls, Idaho, which would be a ten and a half hour drive from Seattle. From there to Moab was another seven and a half hour drive. Jill carefully explained to me that, because we were camping, we would need to arrive during daylight hours in order to pitch the tent. She then went on to explain camping as she understood it, which meant that from the minute we stopped the car to the minute we went to sleep we would be labouring non-stop doing the things that campers do – I cannot explain them in detail because by this point, I had completely lost the plot. It was now my turn to look at her as if she were mad. In my mind I was going over how tents these days practically pitch themselves. Fling them down on the ground, snap a few poles together (conveniently strung together on a piece of elastic), bang down a sleeping bag and you’re done. How was that going to take us hours and hours, and did we really need daylight when we had a flashlight handy? What was I missing? I discovered some of what I was missing when Jill said the camp sites I had found were awful, because they were too mainstream with tent sites too close together. Bathrooms, showers, forget about it, we wanted to be looking for sites off the beaten track, preferably in the woods. Jill produced a roll of toilet paper that she had just remembered to pack. I was beginning to feel queasy and suddenly felt the urge to curl up on the sofa and watch a movie. Was now the right time to bring up the fact that I needed internet access to keep my travelogue current? And so the fun began. Jill was thinking we would drive a maximum of 5-6 hours a day. I pointed out that the estimated drive time of the route we had in mind was 72 hours, so if we drove 5-6 hours per day, we would still be somewhere in southern California by the tenth day. Not to mention that the 5 or 6 hour increments would put us overnight in the middle of nowhere, and require us to drive straight past some of the coolest places along the way. Oh, we squabbled like cats and dogs, trying to reach any kind of compromise. 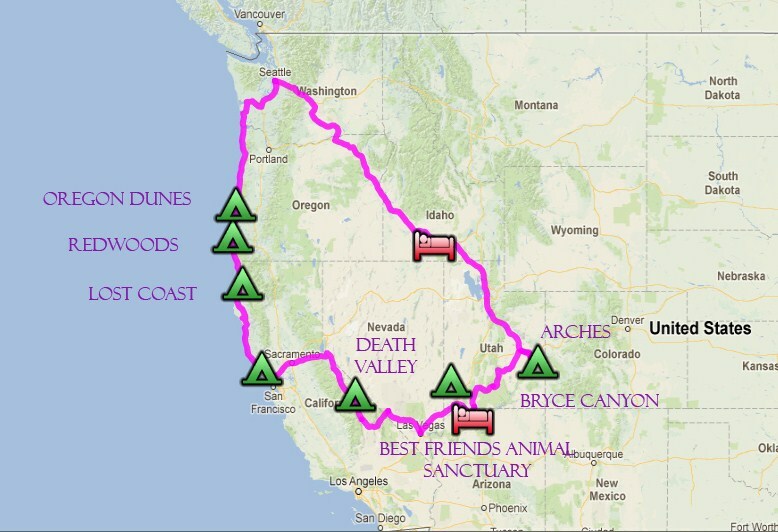 We went back and forth, making cuts to the itinerary; at one point I suggested we pick either Utah or California but my friend was so distraught at the idea that we let it fall by the wayside. She had strong reasons for going to both; one was her head and the other was her heart; she told me that in a moment of deep sorrow, so we put both back on the itinerary and tried to make it work. I didn’t mind where we went, but needed to keep the trip within the set time frame because I had no home, no income and no plan. I could put off the looming menace of cold hard reality for ten days, at a push, but any longer would be just asking for trouble. There were moments when I thought we should call the trip off all together, and I wouldn’t be surprised if Jill considered it too, but for some unfathomable reason, we persisted. Now came the preparation stage. Jill left her resumé and got started on meal planning, figuring out what we would eat each day and creating a grocery list. I looked on in awe; I don’t even know what I’m going to have for breakfast tomorrow, so planning meals for ten days is mind-boggling to me. I’d probably have grabbed a bag of rice, some canned beans and veggies and winged it, but Jill had curry, chili and pasta on the menu, and I have to admit it all sounded really good. She knows her food, and it was also going to work out a whole lot cheaper than getting food as we went along, so we headed down to the local Trader Joe’s and checked off everything on the list. As we shopped and disagreed over what flavour of this and that to get, I was trying not to be anxious about the fact that we still had to get the car in for a service and new tires and we were leaving, umm, the day after tomorrow. The car did get in for a service and tires, but then we realised that because I wasn’t a named driver on the insurance, I couldn’t drive at all throughout the vast state of Utah. Luckily we found out just in time to be able to do absolutely nothing about it. Back at the house, Jill retrieved all kinds of camping gear from the basement, and her husband arrived home with a brand new camping stove for us to bring on the trip. I helped bring up bits of poles and boxes of ropes and assorted metal objects. Then Jill took over, sorting through things and putting them in piles and plastic boxes in some sort of undisclosed order of which I had no comprehension. I was beginning to feel like a spare part, looking on cluelessly as a flurry of activity happened around me, so I started making sandwiches for tomorrow’s journey instead. Then we argued about what should go in the sandwiches and ended up making our own sandwiches. Tension was mounting and we hadn’t even left the house. Jill’s husband wisely stayed neutral, watching us with a sage, inscrutable expression. I’m pretty sure he expected us to come to blows before we’d left the city limits. I wasn’t sure we’d make it that far. With the living room filled with boxes, coolers, bags and piles of camping gear, we stopped for the night. Exhausted and emotionally drained, we retired to our rooms to stuff clothes and toiletries into canvas bags to take with us on our journey. I shoved my copy of ‘Travels With Charley‘ into my bag too, determined to finish it by the end of my trip. Tomorrow we were leaving; it was settled when we made a reservation at a motel in Twin Falls, Idaho. One way or another, we were going to make it happen. This entry was posted in Travel, Washington and tagged humor, postaday, road trip, travel, writing. Bookmark the permalink. Hee hee, thanks Chillbrook, it’s going to be an interesting journey! Goodness, you’ve set the scene for a very interesting road trip. Can’t wait…! Really looking forward to your next instalment. I’m interested to hear more about the food. And do you have two tents, or one two-person tent? Oh my – I hope your trip works out better than it started! Can’t wait to hear more. I’m guessing the trip must have got better, because you’re writing about it… either that, or you and Jill are now irrevocably estranged and she will never read your blog again so you can write whatever you like. Either way, I’m intrigued and looking forward to part 2! Great comment Jo, I couldn’t have put it better! myself! I think I’m more like you, I just grab my backpack and go, it’s pretty ready at all times. Eat when I’m hungry, sleep when I’m tired. Tents are easy to set up, the second time. Don’t try to set up a new tent in the dark. I’m with you, Suzan, the toilet paper made me want to run screaming. Hee hee there’s definitely a book in this! You’ve got me hooked already Ailsa! Hilarious! Been there, done that and most definitely won’t be doing it tomorrow. Interested to read also about the food and what you will prepare as you camp. Aww, I can hardly wait for the next installment, is it ready yet? How about now? OMG, what a challenging trip this is going to be. Been camping, but only the fairly civilised sort, although Jills’ intended version of camping reminds me of camping as a girl scout a long time ago when we all had to take turns cooking and digging the latrines. Enjoyed every minute of it! Oh gee….that is a LOT of little triangle camping spots and not so many motel beds….. I am pretty brave, but not sure if I would be that brave. 🙂 Can’t wait to hear the rest. Haha, yes, Angelia, there are rather a lot of green triangles on there, aren’t there? Gulp. We camped Jill’s way when I was a kid and my parents were in control. As an adult, nope, not my idea of a good time. I’ll be interested to read how this trip goes. I’ve only travelled with polar opposites a few times, and found it to be very stressful. I like my usual companions: my husband, my kids, my mother. We all have the same ideas and attitudes about how a trip should be. I travelled with my mother-in-law and sisters-in-law once and discovered how different travelling could be. I had a good time with them, but had to add on a couple of days to tht etrip so that I could finally go do the things I wanted to do. They were more about visiting with each other around a campfire. I was all about seeing the sights. We haven’t travelled together since. I’m with you, Browsing the Atlas. I figure you can visit with each other round a fire pit in the back yard. Why travel to a different part of the world and miss the sights to do something you could have done at home? Looks like you’re headed into my territory (OR dunes)… I remember doing a trip with my boss years and years ago. I ended up ditching him halfway through the trip. That was certainly fun! Oddly enough I did keep my job. The decision to part ways was more or less mutual… he opted to hitchhike home, while I went my merry way. His non-stop jabbering was driving me up a wall and we couldn’t agree on places to stop. I’ve never been very good at putting together a coherent story (can’t spin a yarn like you do!) But the basics were: a gay boss, working at the San Francisco welfare department in the early 70s. He opted to spend the night on an Oregon beach, while I curled up in the back of my VW bug. I took off the next morning (as agreed). Back at work, it was as though nothing out of the ordinary had happened…. Well, I know that you survived – just waiting to find out if Jill did – or where you buried the body! This should be interesting – I’m looking forward to the next chapter. I saw Best Friends Animal Sanctuary once and it was amazing. And beautiful. Enjoyed the narrative, but would’ve loved to have seen a few photos to go along with the text. Sounds like an exciting trip, Ailsa. Looking forward to hearing your travel stories. What an AMAZING loop that will be!!! O EARTH i cannot wait to get off parole!! I’m gonna borrow my mom’s pickup and hit the road for at least a month, sleeping in the back =) PLEASE do yourself a favor and visit Jedediah Smith Redwoods State Park in Del Norte County–and get there by driving up Howland Hill Road, it is one of the most spectacular and awe-inspiring drives you will EVER undertake! Looking forward to further installments. Thank you! Yes, it’s otherwordly…I can’t wait to go back and spend more than half a day there! There’s plenty of adventure in store, I promise! Ooph – dang, she IS a serious camper!! I camped for 2 months in Canada a couple years ago, but we definitely had toilets and showers! And why make a tent more difficult to put up than it needs to be? Can’t wait to find out what happens next! Plenty of photos in store, I promise, Sandra, and perhaps a video or two! wow, what a story! love your humor! very very funny. thank you.